As the first recipient of the Faculty Climate Action Champion Award, physics professor Sue Carter will establish a campus sustainability lab to support student-led research and training. Carter, who was chosen for the award by the Sustainability Office and the Academic Senate's Committee on Research, submitted a proposal that includes a strong plan for student and community engagement. "We'll set up both indoor and outdoor spaces with the facilities, equipment, and mentorship for students to pursue their great ideas about how to make the world more sustainable," Carter said. "There is a big demand among students for more opportunities for experiential learning and hands-on experience, particularly working with the built environment and finding solutions to the problems of sustainability and climate change." Carter is among the UC experts joining Gov. Jerry Brown, UC President Janet Napolitano, and others at the UC Summit on Carbon and Climate Neutrality, October 26 to 27 at UC San Diego. The Faculty Climate Action Champion Award promotes faculty innovation and leadership in climate change research, teaching, and engagement. The award was developed through the Office of the President's Global Climate Leadership Council to support UC's Carbon Neutrality Initiative, which commits UC to emitting net zero greenhouse gases from its buildings and vehicle fleet by 2025, something no other major university system has done. The Climate Action Champion Award provides $25,000 and institutional support for Carter's efforts to deepen climate change teaching and research on campus. According to Carter, the involvement of students is essential to meeting the campus's sustainability and carbon neutrality goals. "If we can mobilize our students to start working toward solutions, they can be a source of innovative ideas for how to meet those goals," Carter said. She plans to use the Climate Action Champion Award to develop a sustainability curriculum, online course materials and training modules, and a web site where students and faculty can find resources. Plans for community engagement include public events and a K-12 Climate Action Summer Camp at the sustainability lab in summer 2016. Carter also plans to develop a curriculum and mentorship network for entrepreneurship focused on sustainability and climate action. An entrepreneur herself, she has launched several start-up companies, including two based on her research in solar energy technologies. 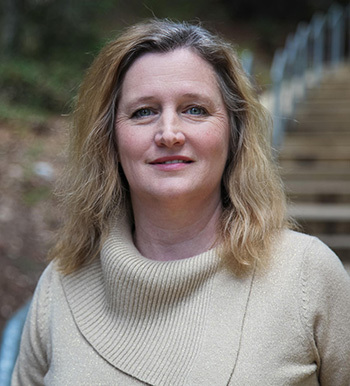 Carter also directs the UCSC Center for Innovation and Entrepreneurial Development (CIED) and plans to incorporate sustainability into CIED programs. For example, she will include a sustainability module in a summer entrepreneurship academy to train students about entrepreneurial skills and resources that are specific to sustainable innovations. For the mentoring network, Carter plans to involve entrepreneurs from Santa Cruz and Silicon Valley who have been successful in launching "green" enterprises and who will serve as mentors for the student teams. "We hope that at least some of the ideas developed in the sustainability lab will get spun out into innovations that can be licensed or incorporated into existing companies or startups," Carter said.